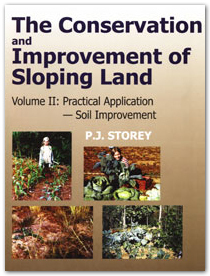 The Conservation and Improvement of Sloping Land, Volume ll: Practical Application – Soil Improvement. P.J. Storey. 2003. 251 pp. ISBN 1-57808-250-1. Science Publishers, Inc. P.O. Box 699, Enfield, New Hampshire 03784, USA. Regular readers will recall a review of Volume l of this series in the Oct. – Dec. 2002 Newsletter. That volume dealt with the principles of conserving and improving sloping land in the humid tropics. I am pleased to be able to announce that Volume ll, Practical Application – Soil Improvement, is now available. This volume is also written by well-known WASWC member, Peter Storey, in the same easy-to understand English as the first volume and it includes a great amount of practical, useful information. The book is well illustrated and contains numerous examples from different parts of the developing world. I particularly liked some of the tables that list such information as the plant nutrient content of various plant and animal residues that can be applied to improve the soil and the "companion planting guide" that lists plants that can aid or hinder the growth of companion plants. The author challenges some of the more conventional measures for conservation and soil improvement and, while some of his ideas may be unconventional, they are based on his many years of experience in tropical, developing countries. The book is divided into two sections. The first starts with a general discussion about the importance of soil and then a chapter explaining what soil is and how it is formed. The following chapters concentrate on better plant nutrition, improving soil management and soil micro-organisms. The second part of the book includes chapters on livestock; forestry, agro-forestry and bamboo; appropriate field trials; weed control; research and development needs; and extension policy, methods and related considerations. I believe that this book will be a very useful guide to many of our field workers. It is the sort of book that many field projects could profitably buy and provide for the staff they are training as extension workers. Of particular value is the simple way that complex subjects, such as the soil’s cation exchange capacity, are explained. I now look forward to Volume lll that, I understand, will be devoted to the practical application of soil and water conservation.